Improved sales in second half push export volumes into positive territory. U.S. dairy export volumes improved as 2016 unfolded, led by record sales of dairy ingredients. Exporters shipped 1.89 million tons of milk powders, whey products, lactose, cheese and butterfat last year, up 3% from 2015’s level. On a value basis, exports totaled $4.70 billion, down 10% from 2015, and the smallest figure since 2010. The final export numbers were aided by a strong second half of the year. Export volume was up 15% in the second half and up 19% in the fourth quarter. On a value basis, exports were up 11% in the fourth quarter. Mexico remains the largest overseas market for U.S. dairy products, with 2016 trade of $1.22 billion, down just 5% from prior year. Shipments to Southeast Asia were off 21%, to $671 million, while exports to Canada increased 14% to a record-high $632 million. Exports to China were down 15%, to $384 million, and shipments to South Korea, Japan and the Middle East/North Africa (MENA) region all fell by more than 20%. U.S. exports of nonfat dry milk/skim milk powder (NDM/SMP) reached a record-high 602,268 tons in 2016, up 8% from the year before, according to USDEC calculations. Official USDA data show an increase in whole milk powder (WMP) exports to Mexico. However, Mexican import data and trade sources don’t corroborate this, and we believe this volume represents SMP sales that were misclassified at the port. Therefore, we’ve adjusted NDM/SMP and WMP trade data for April-December to account for this misclassification. Adjusted exports to Mexico were just shy of 280,000 tons, up 11%, while sales to Southeast Asia (led by the Philippines and Indonesia) were nearly 200,000 tons, up 16%. U.S. exports of whey products also reached a record high in 2016, topping 500,000 tons, up 14%. Shipments to China were particularly robust, accounting for 211,949 tons, up 27%, while sales to Southeast Asia (100,249 tons) were up 10%. U.S. suppliers shipped 141,402 tons of whey protein concentrate last year, up 36% from the year before. Half of this went to China, which boosted purchases by 78% year-over-year. Total exports of modified whey products (mostly whey permeate) were 134,013 tons, up 11%, with China, again, taking close to half the volume. Dry whey exports were 191,763 tons, up 7%, led by a 50% gain from China. Exports of whey protein isolate were off 5% in 2016, the first decline in eight years. Exports of lactose topped previous highs as well, with 2016 shipments of 362,110 tons, up 1%. Cheese exports were down 9% in 2016 to a four-year low of 287,028 tons. Sales to Mexico were off just 1%, but volumes to South Korea, Japan and the MENA region were all down 20-25%. U.S. cheese exports did improve in the fourth quarter, however, with shipments up 10%, year-over-year. Fluid milk and cream exports hit a record high 114.4 million liters, up 17% from the year before. Sales to Canada and Mexico were up 30% each. Exports of WMP (-25%, adjusted) and milk protein concentrate (-30%) lagged prior year levels. Exports of butterfat were up 13%, but totaled just 24,332 tons. 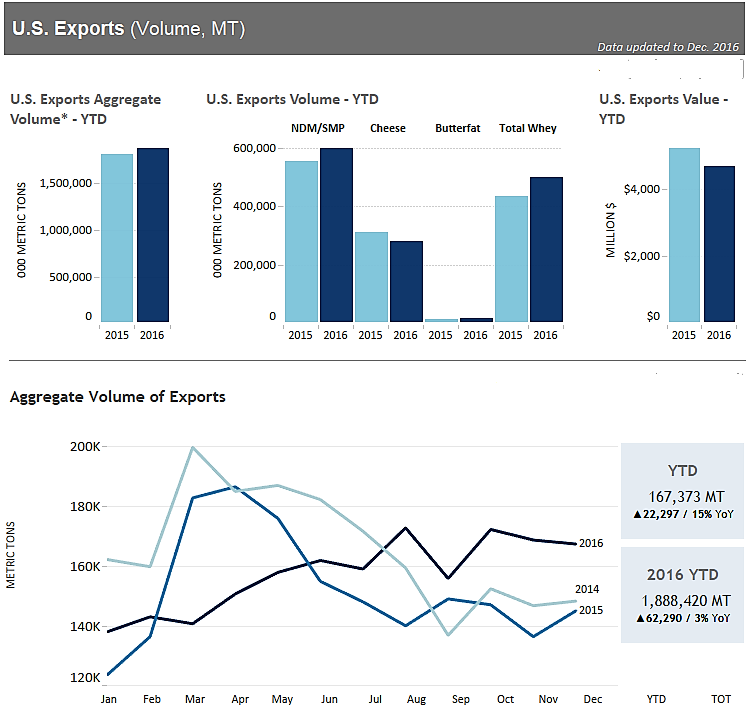 Click here to see USDEC’s monthly trade data summary, which has additional analysis of export trade trends. Alan Levitt is vice president of communications and market analysis at the U.S. Dairy Export Council. The U.S. Dairy Export Council fosters collaborative industry partnerships with processors, trading companies and others to enhance global demand for U.S. dairy products and ingredients. USDEC is primarily supported by Dairy Management Inc. through the dairy farmer checkoff. How to republish this post. .